There was a free concert Friday morning. 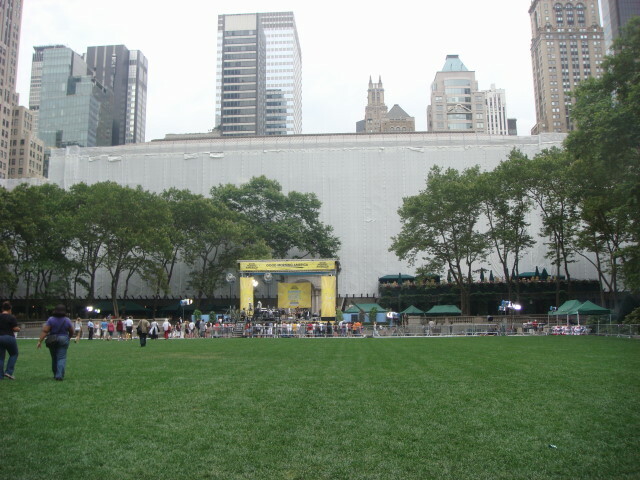 This was part of a series of concerts at Bryant Park featuring such music as Counting Crows, Usher, Cyndi Lauper, Boyz to Men, and a couple of others. Hint: it was free in the sense of no money forked over. It sure wasn’t free as far as I was concerned. 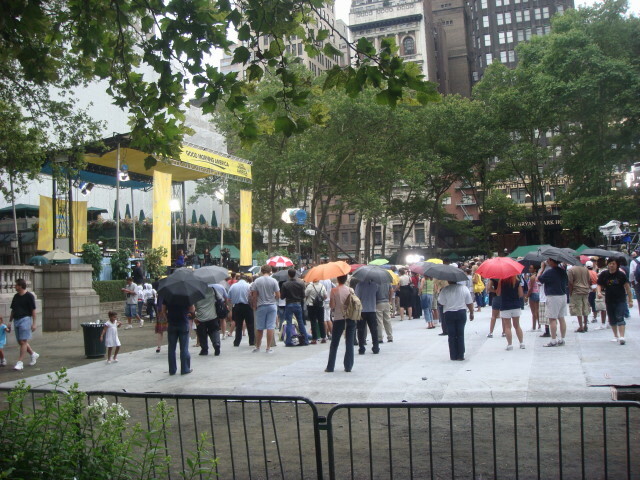 It was in Bryant Park. The notice said from 7am to 9am. I instinctively knew it wouldn’t be a two hour concert. My instincts failed me in that it was really about a 9 minute concert. I got there at just about 7am and saw that it wasn’t that crowded. Eventually, it did grow to a number of hundreds of listeners, but the park never came close to being even remotely filled. For the first, oh, hour plus of the concert; very little happened. Chaka Khan was nowhere in sight. The band was playing the same one or two songs over and over and over again. And again. And occasionally doing some jamming…which morphed into the same song or two. I was incredibly bored. Wow. I sat down and looked at people’s legs for about 30 minutes. There was no seating, but they had spread out a tarp of some sort. So, I sat and looked at people’s legs and tried to figure out what the heck I was doing there. 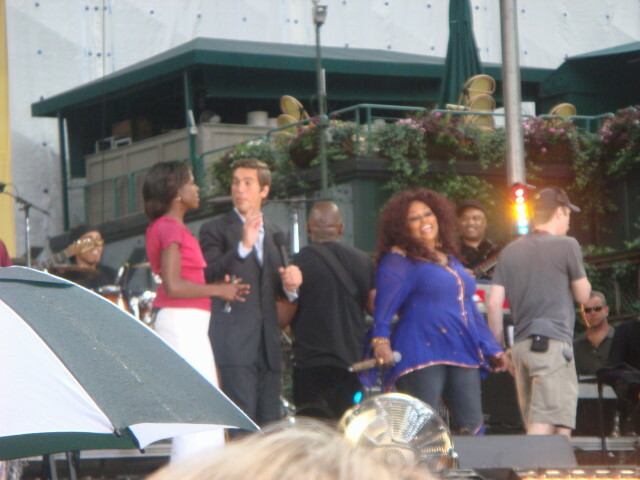 And then the GMA hosts came out. Here they are talking into their microphones. Not to the crowd, mind you. Their mics were geared to talking on the TV, not to the loudspeakers. Yeah, we watched them mouth words. For all I knew they were hurling mighty invective towards the suckers that expected to hear something besides the same song or two, over and over. About 8:30, we got the words that Chaka was on the way. Two minutes were called. 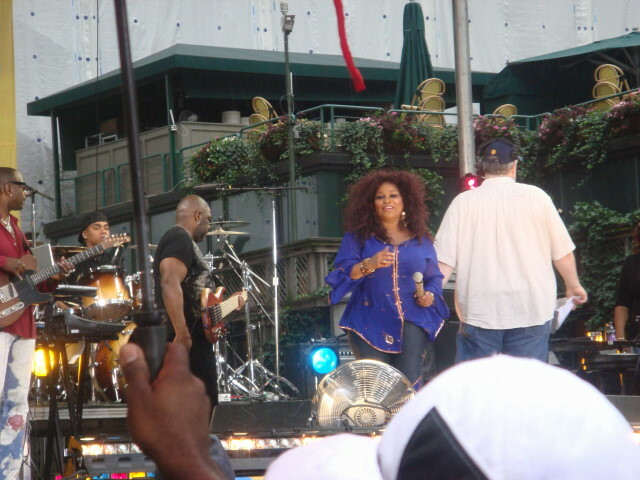 About five minutes later, Chaka came out and appeared to start singing. Her mic wasn’t on. The amazing thing is that we had watched some guy testing the mic earlier and having no luck with it. Apparently they expected that Chaka would overcome that particular hurdle. Thankfully, about 30 seconds into the song, she realized what was going on and stopped. Otherwise, it would have been one of those same tunes we have been listening to for so long. I will say this: she did have some magic. She started testing it, failed, and then shouted out to the crowd that she was going to get it fixed. We heard her, then. She has a great voice. You could just seeing her dominating a concert hall with that strength. So, Chaka did her song and then got interviewed by the GMA hosts. I don’t want to even bother knowing who they are. They didn’t care if we heard them and I don’t care to know their names. The only time we heard their voices was when their voices leaked over Chaka’s mic to the loudspeakers. Chaka then sang two more songs. One of which was the other song we had heard lo those many times (I think). I don’t really know her music so differentiating it was tough for me. Lots of the crowd knew the words, though. Not me. I’ve been to the area about five to seven times; Tompkins Square Park. One of my favorite spots is the Temperance Fountain. That fountain was established a hundred years ago to provide fresh water and (hopefully) wean people away from alcohol. 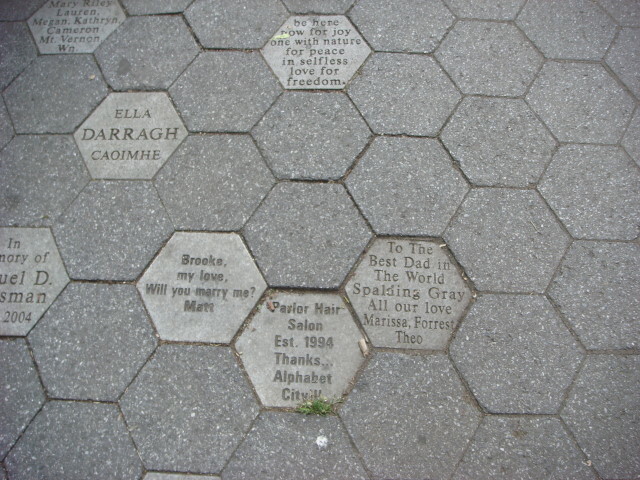 I had never noticed that the pavers around the fountain had dedications. Not all of them, but a bunch. As I circled it and looked (‘cuz I’m that kind of guy), I spotted a familiar name: Spalding Gray. I never knew him or met him. I best remember him in the movie “Swimming to Cambodia”. He was something of a mezmerizing storyteller. But I do know that I enjoyed his monologue in Swimming to Cambodia. Absolutely riviting. I saw parts of “Monster in the Box” and enjoyed that, too. 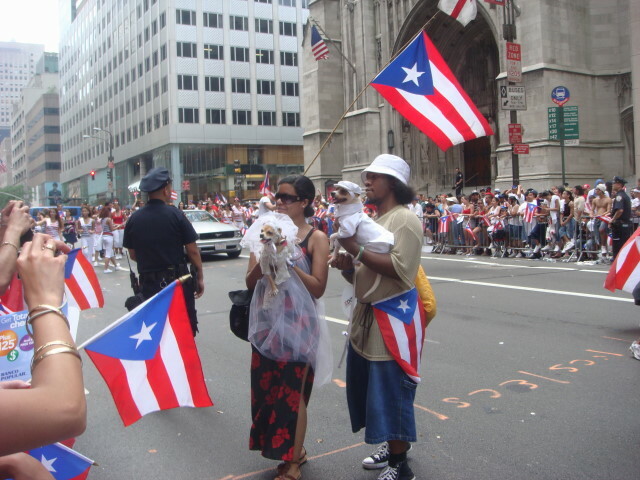 My third, and last post on the 2008 Puerto Rican Day Parade in New York City. And I start off with one of my favorite photos of the day. Okay, my favorite photo. This is radio station 1280, WADO. 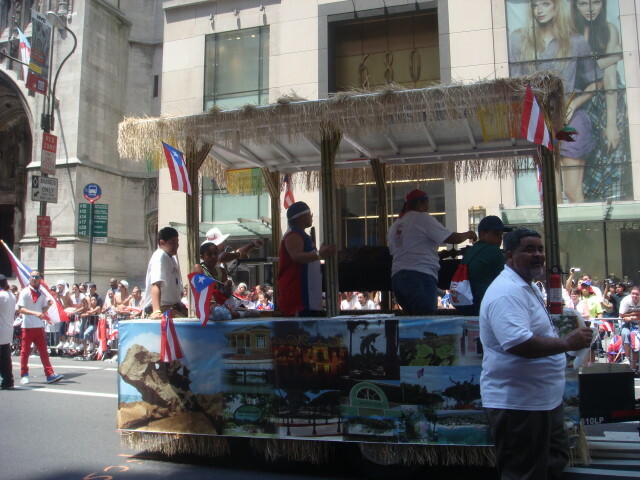 They had a nice float filled with staffers. One of them spotted me taking pictures and held her pose of blowing me a kiss for about 10 seconds. At the end, I gave her a big thumbs up and we both laughed. She oughta be a beauty queen. More cars. There was a pretty long line of them at this point. More beauty queens. This time I had the zoom on. Let’s combine ’em! 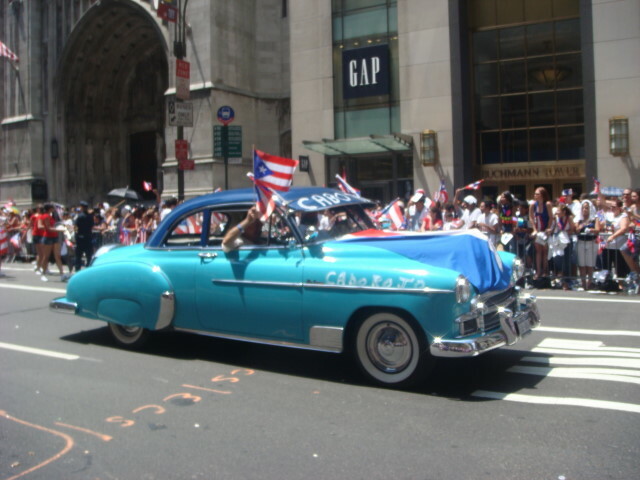 A cool car with beauty queens! The ladies below are representing CUNY (City College of New York). Interesting hosiery ladies. But, don’t ya think representing a pretty good school ought to entail something a little less…declasse? Speaking of class. Dogs in wedding dress. 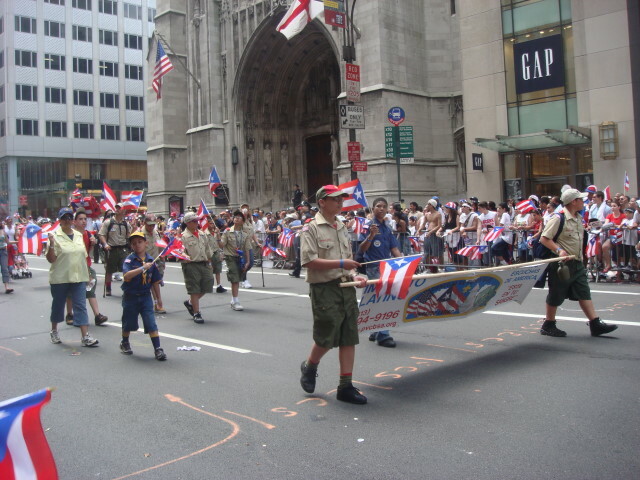 Okay, the Boy Scouts were represented by a small contingent. But were they prepared for the heat? Probably, hey, they’re scouts. A little dance group. Very pleasant. This was a “support the troops” sort of group. Actually, they were a “support the family of troops” group. No other sign of the war in the parade that I noticed. Now this was a very pleasant surprise. 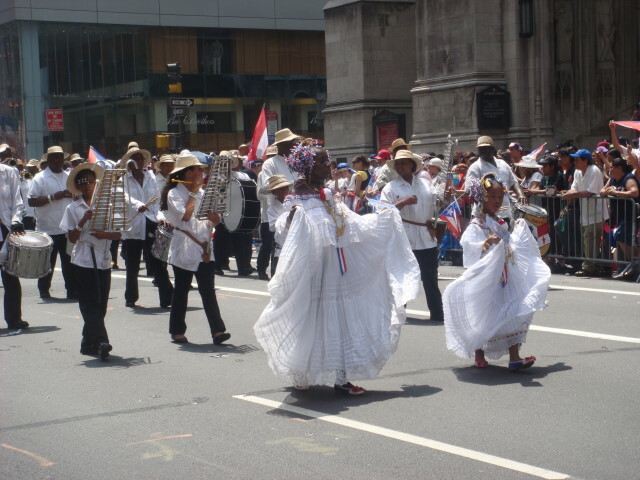 The “Taino“, an indiginous group of Puerto Ricans (actually from all over the West Indies). I knew they existed, but didn’t know their name nor really anything about them. 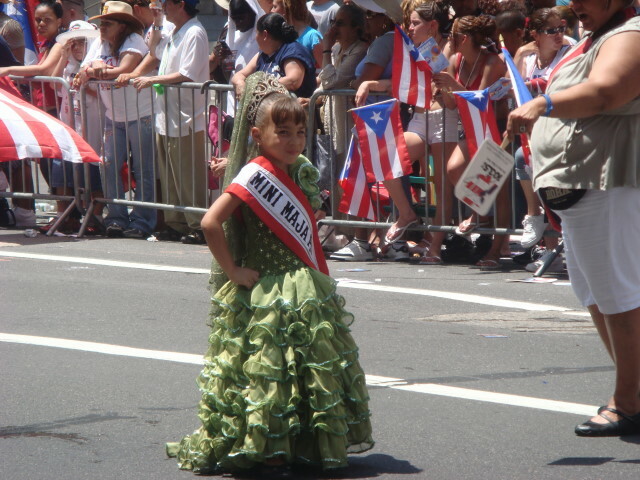 According to the Wikipedia entry, 60 percent of Puerto Ricans have Taino heritage to some degree. Well, one area of Puerto Rico that I know is a formal name: San Juan. They sent a float. With beauty queens. Zillions of ’em, I tell ya. 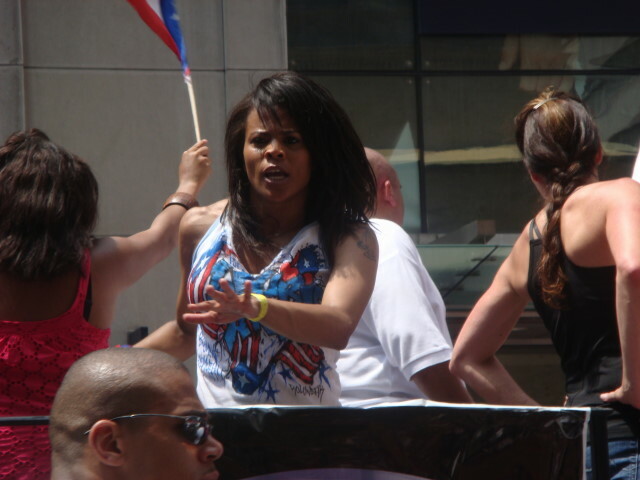 Another reason I didn’t get a good picture of Jordin was the below woman. She was a dancer and was the absolutely most intense dancer I have ever seen. Her determination to boogie was astounding. I think this picture captures it. Her expression never changed. My second favorite moment of the parade. Another marching band. A bit different than most. 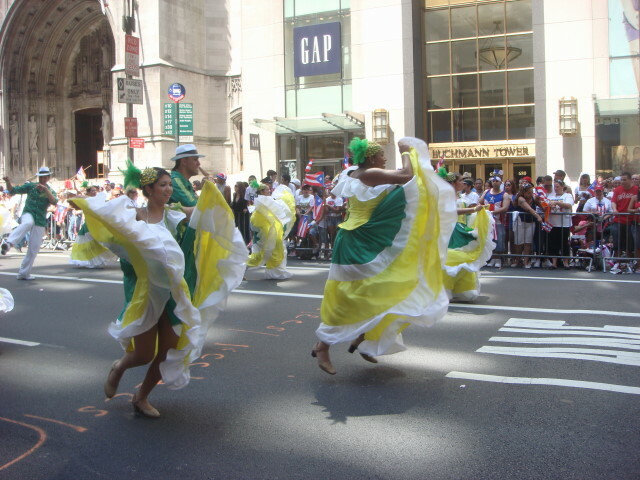 I really liked the dancers/native costumes in the front. 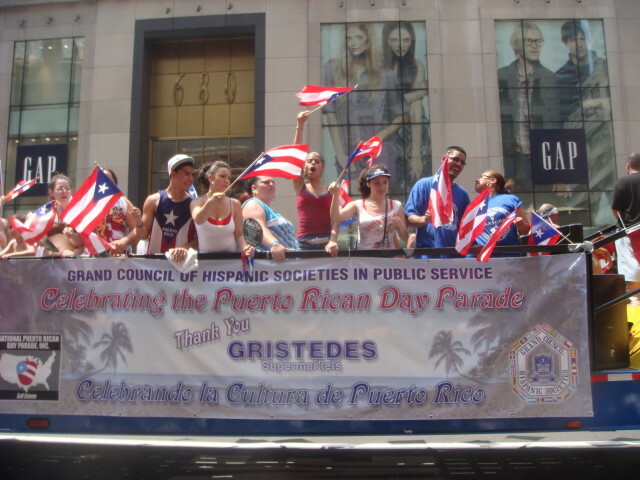 This last photo is the Grand Council of Hispanic Societies float. The young lady in the center was feeling energy I no longer had. I left the parade after being there for four hours. It was long. It was hot. It was only about half over. I just didn’t want to stay anymore so I ankled home. 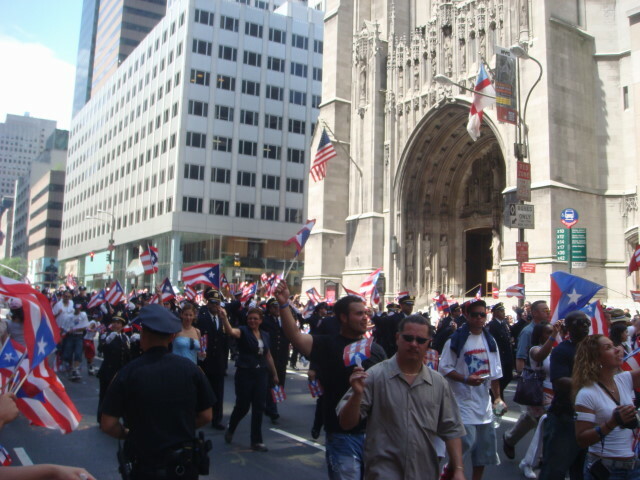 To start off my second part of the parade coverage, I’m gonna show the “big flag” picture. Every parade seems to have one. Last year it was really cool. The crowd had thrown coins onto the big flag and when the marchers waved it, you could see the coins flying up several feet. This year, nothing. 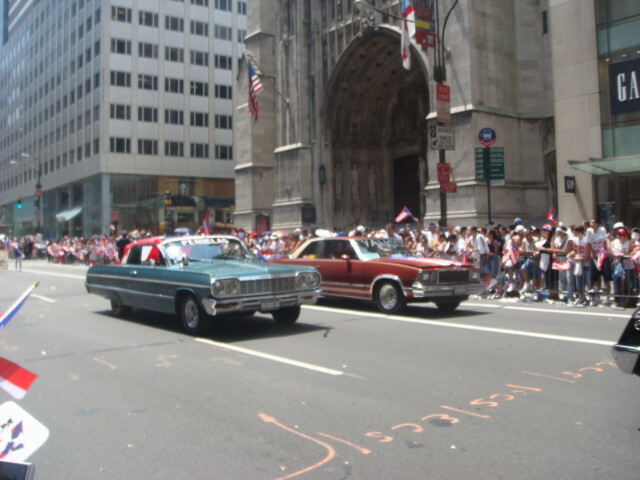 The parade had a lot of cars being shown off. I’m not that big of a fan, so I’ve excluded a lot of them. But the one below was a nice car with a beauty queen. After seeing Weiner and Schumer (not to mention Diaz and Bloomberg), I knew Congressman Charles Rangel wasn’t going to be left out. And there he was in a really nice red convertible. I loved this group. The stilt dancing was pretty professional. I was impressed and I think the crowd was, too. An ambulance company sent in a beauty queen. And why shouldn’t they? Next came some pretty enthusiastic and good dancers. I enjoyed them, but don’t know how they handled the heat. 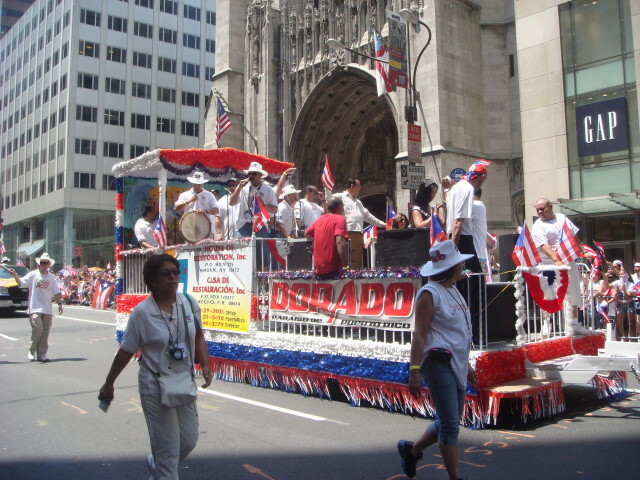 If you’re a healthcare company (I don’t want to bother looking up the name) and you want to be in the parade. How do you do it? Well, sending in bunches of dancers is not a bad way to go. Politics, gotta have some. 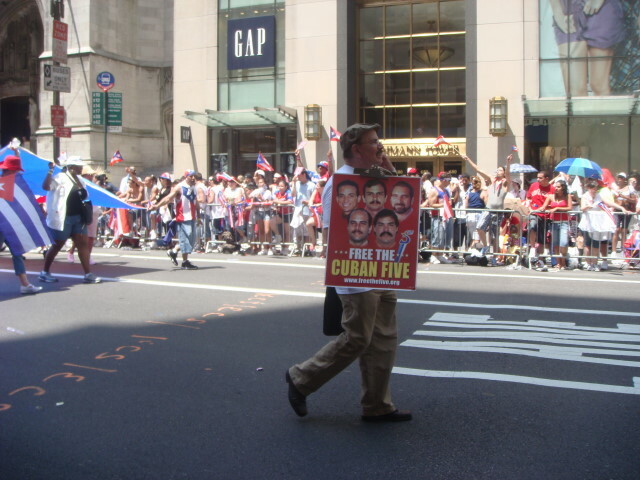 These were protestors wanting the release of the “Cuban 5”. They are the group that helped kill some from “Brothers to the Rescue“. They were also convicted of some spying related charges. A bunch of them. A car dealer sent in a car…with a beauty queen. A truly practical float. A float you could get your teeth into. A lady on the float was cooking BBQ and handing it out to marchers. Not to attendees, though. The guy in the foreground (right) had just picked up his lunch when I snapped the picture. From “NuLife Entertainment”, came a float. And the float had two dancers. And it was good. 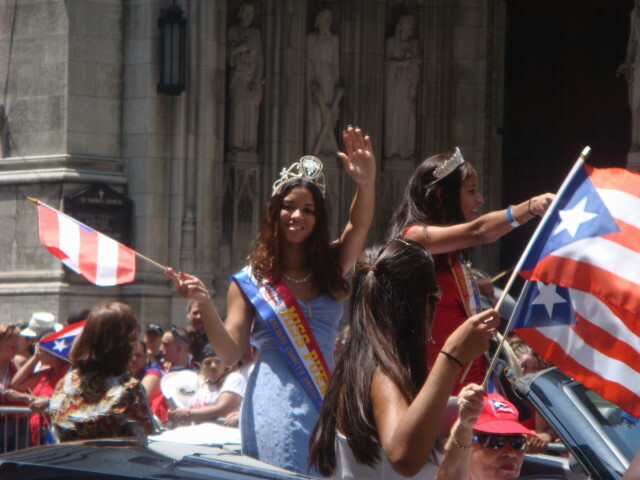 Some beauty queens from Salinas (I guess another area of Puerto Rico; and probably not from Salinas, Kansas, where I’ve been before). A genuine celebrity spotting. And I did it myself. A float for Walt Disney’s upcoming movie “Beverly Hills Chihuahua”. I looked at the float and didn’t recognize anyone. 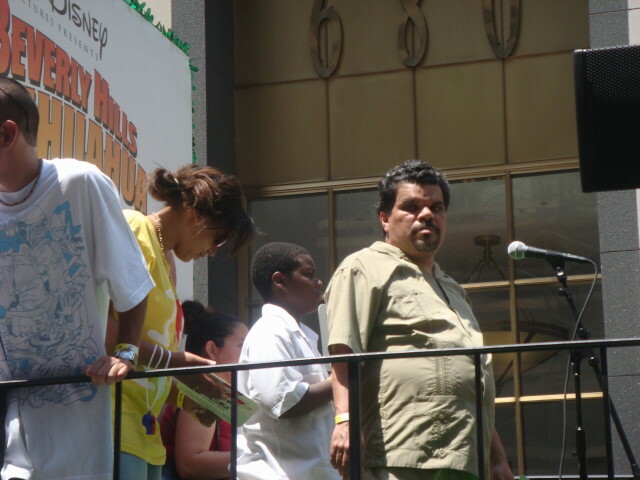 But then I saw this guy and the light of recognition came on: Luiz Guzman. I’ve seen him in a bunch of stuff. The most amazing part of it? IMDB doesn’t have him in the cast of Beverly Hills Chihuahua. He apparently just jumped on the float. I guess these are celebrities. They’re from MTV’s Total Request Live (TRL3). I haven’t the foggiest idea of who they are. I was a bit mystified by the next group. I’m well aware of high school and college marching bands. Even professional groups. 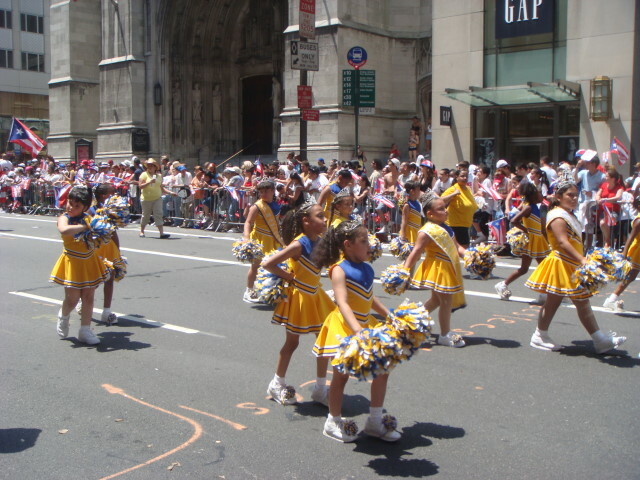 But this marching band was from…the New York Department of Education. Say, what? Not a school, but an entire department of State government? This little lady stood apart. Very poised and closely attended by a relative (I presume). She never faltered in how she held herself. She was actually, I suppose, to be the first in a line of others. But they were well back from her and I couldn’t get a good picture of them altogether. So, two pictures. And the below ladies were trailing our tiny beauty queen. I like to think of them as her beauty-queens-in-waiting, but that’s just me. The dance group from StarLite Dance Studio was pretty good. 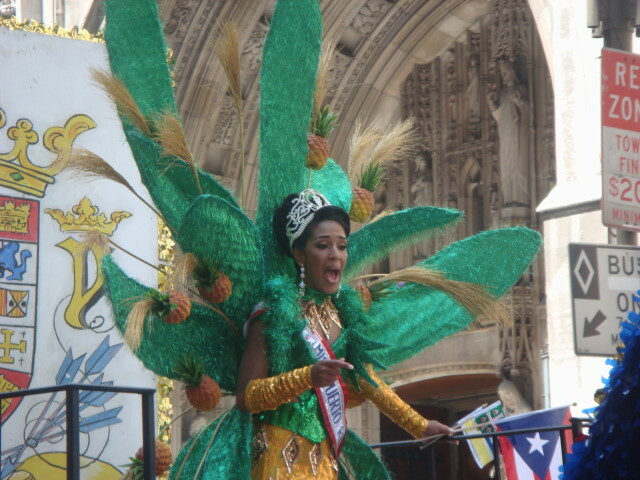 I told you in my first post that there were zillions of beauty queens. Here’s another of the zillions. 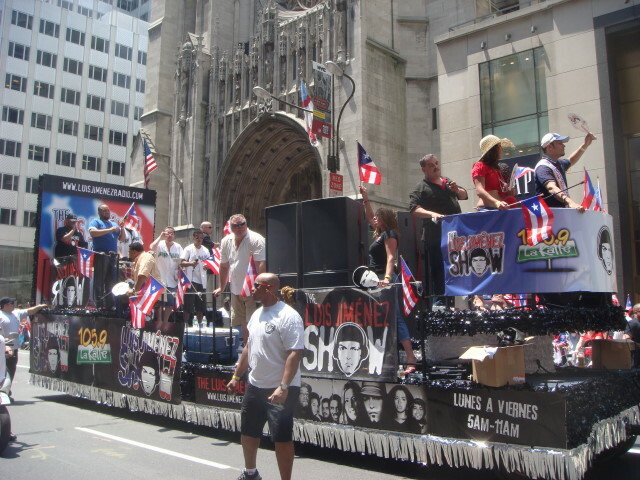 The Univision TV network sent in a float. It had been a while since we had cheerleaders. So, Morovis (presumably another Puerto Rico district) sent us some. Unique? You want unique and maybe a little strange? Take a look at this guy. He was attached at the feet with this doll and spent his (their?) time dancing around the street. Oh, and he was sponsored by Jet Blue. I kind of had to see it to believe it. In NYC. 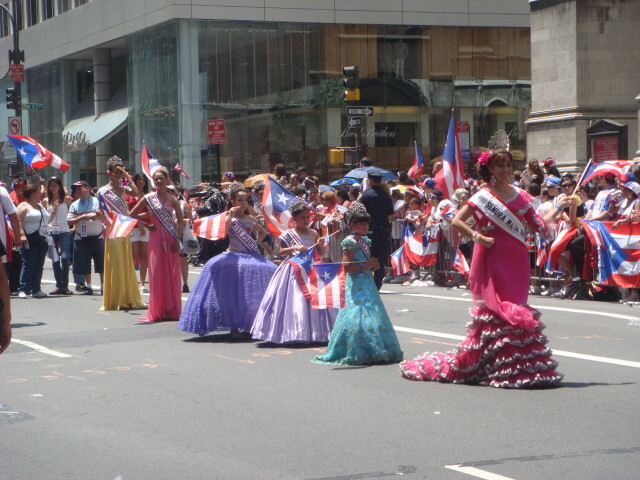 The Puerto Rican Day Parade. 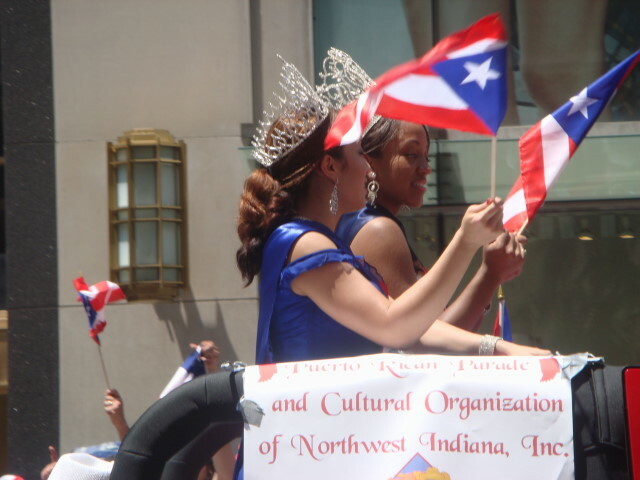 Why not find beauty queen Adriana Rosato from Indiana to represent the Puerto Rican Indianans. Actually, she was fine. Why didn’t other states send in their representatives? It was a pretty good sized crowd. Not as big as last year (at least from my standpoint). Just one of many car pictures I took. Apparently, the Luiz Jiminiz Show is very popular and well-regarded. They pushed this show in the parade at a number of points. One thing I saw a lot of was hand-fans that were of Luiz Jiminez’s face, sort of in a Che sort of look. You can see it below. 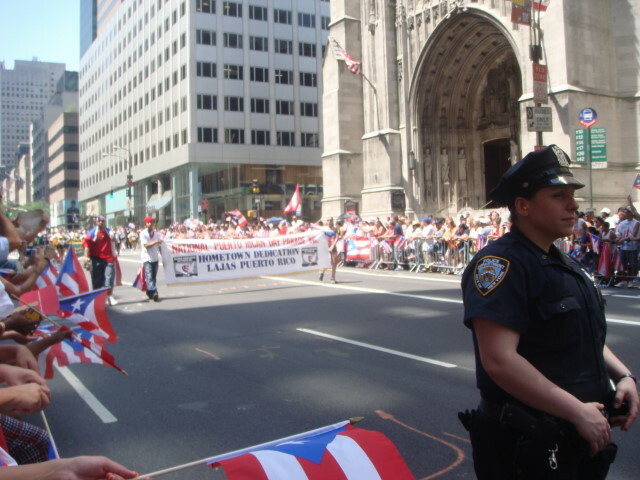 Sunday was the annual Puerto Rican Day Parade in Manhattan. 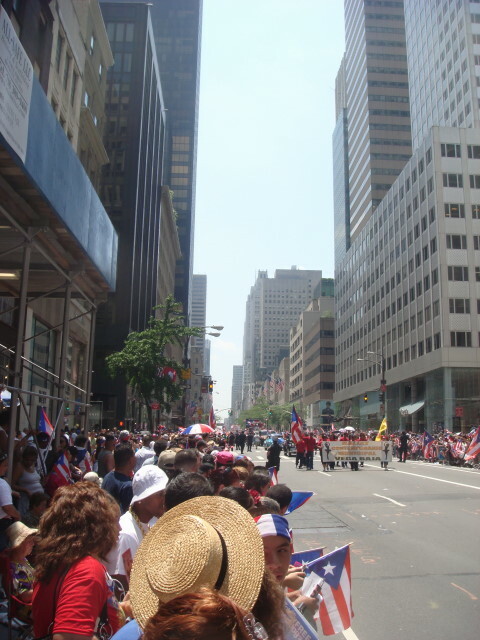 It, I believe, is the largest parade in Manhattan. And the loudest. I had my rules (posted Friday) and mostly followed them. 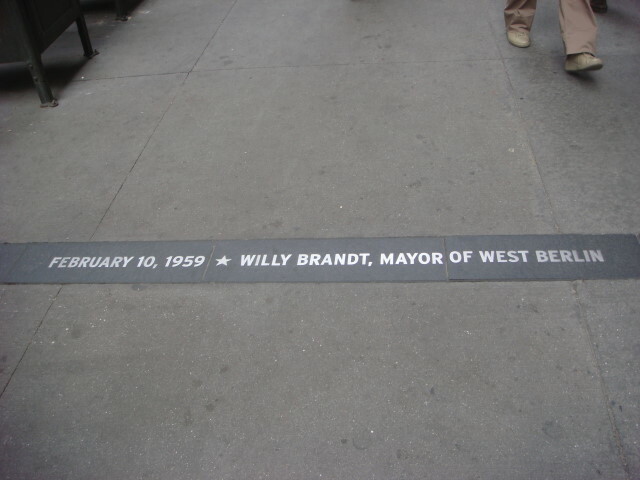 I was at 53rd Street on 5th Avenue. Not a bad spot, but one I thought I might have to defend at one point. I got there around 10am and it was the first open spot on the route that I found (having walked up from about 49th). After I was there for about 10 minutes, a man and woman walked up and announced that they had reserved the spot. I sputtered “reserved?” in an incredulous voice and then said I had been there for 10 minutes. They counter-announced that they had been there and had left to get breakfast. I thought better of saying the obvious counterpoint. And then they said that their family was right there, too. Next time, folks, tell your family to announce your “reservation”. I didn’t budge. Not true. I shifted over about 4 inches. I was in a rebellious mood and didn’t want to give up a good spot in the shade. Anyway, that’s where the argument began and ended. They fit in with the rest of their family and we didn’t speak again. No threats or anything like that; just a brazen announcement made that was supposed to chase me off. But I guess I was more stubborn than they expected. 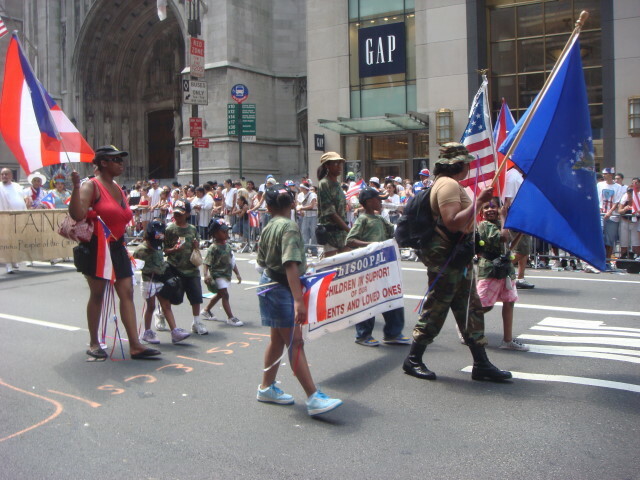 After an hour, the parade started. It’s a big parade. I didn’t make it all the way through and still ended up with way too many pictures. First, the Hispanic Police group. After them, as usual, came the dignitaries. Lots of them. 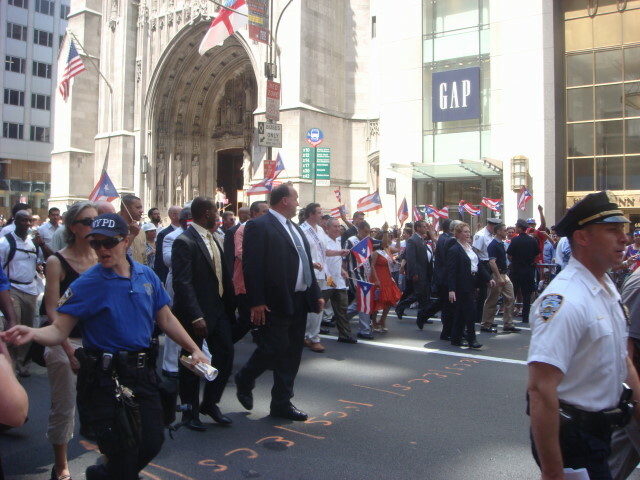 I didn’t know I had taken his picture, but the guy in the white shirt, center, is Mayor Michael Bloomberg. My area was pretty popular with reporters. I figure that if they wanna block my view, I can take a picture of the back of their heads. I believe this is a NY1 reporter and cameraman. And the dignitaries kept on coming. Here’s the City Council. 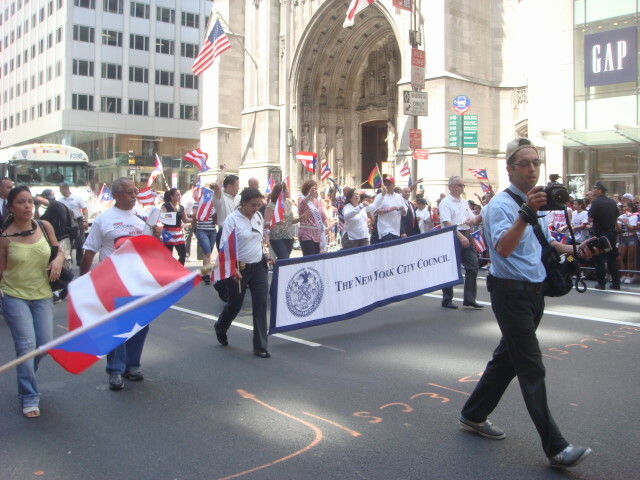 A number of areas of Puerto Rico were represented. I really could never figure out the beginning/end of these groups. But this is the Lajas group. The cop in the picture was around for about half the parade. 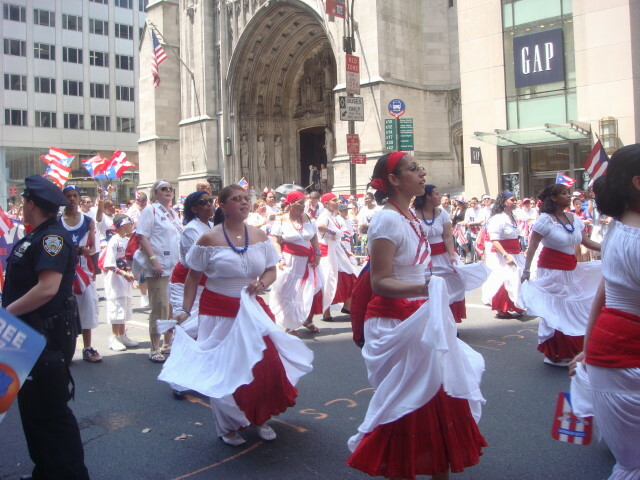 Lajas dancers. This was one of the best groups I saw all day. 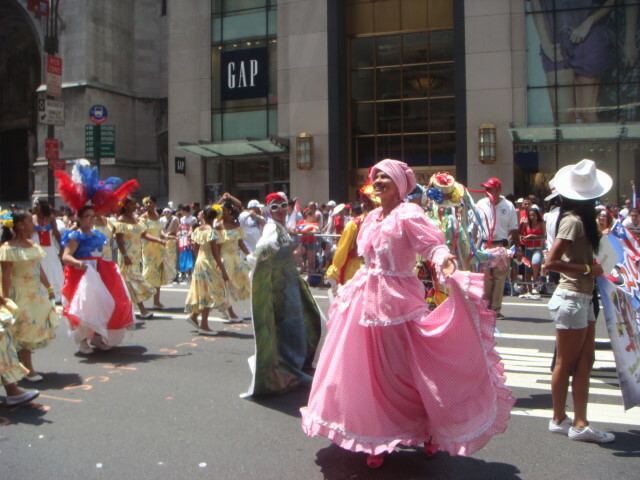 I liked the liveliness and the native costumes. 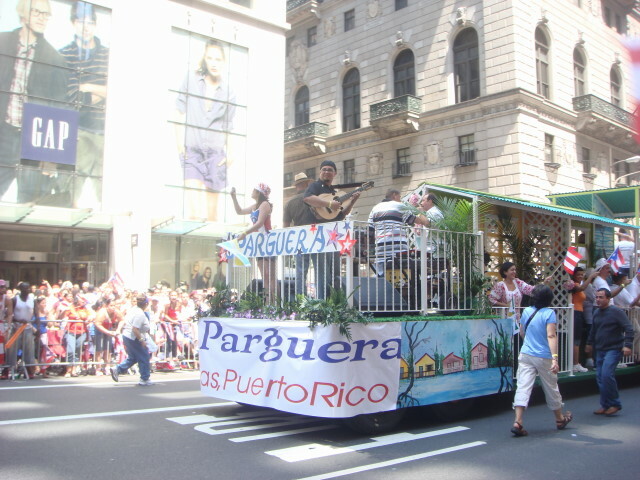 I think Parguera is another area of Puerto Rico. Might be part of Lajas, might not be. See what I mean when I said I just couldn’t tell about area designations? 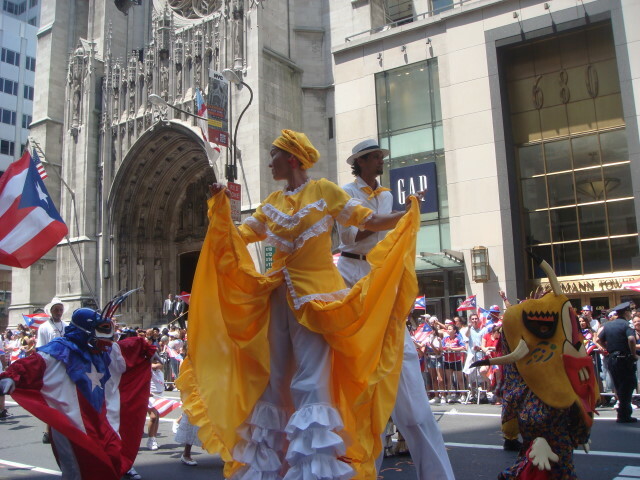 And this was the Lajas Folklore Ballet group. So, we’re still in Lajas…maybe. No dancing by this group. Just walking and looking elegant. More dignitaries showed up. 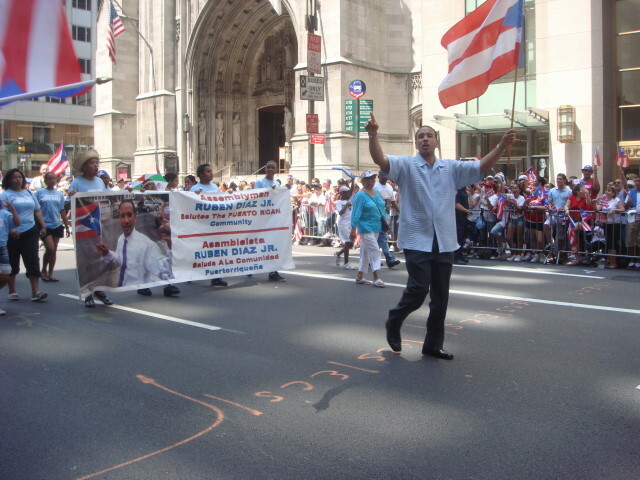 This was NYC Assemblyman Reuben Diaz, Jr.
Another dignitary. 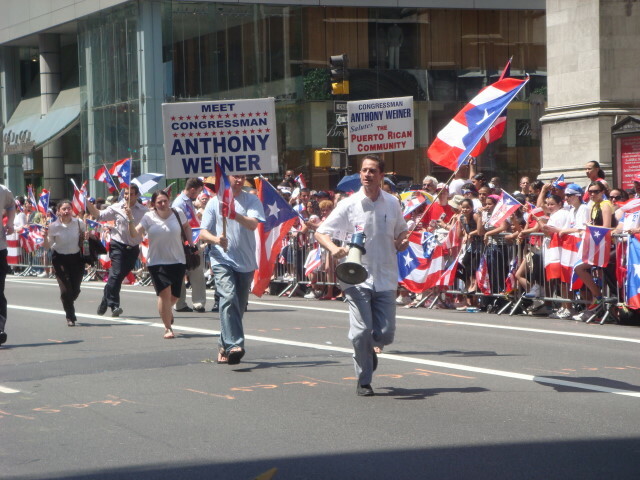 The one and only Congressman Anthony Weiner, complete with bullhorn and sign bearers. I’m proud of this shot. I call it the “Weiner Run” and I see him do it all the time. He’ll go to the side and talk/shake hands and then bolt out from that group as if he’s spotted someone he knows further on. It gives him a chance to break away from the handshaking. I don’t envy him doing this for a couple of miles in that heat! And it was as hot and humid and NYC summers get. This guy had a more leisurely way of getting around: roller blades. He just looks like a character and certainly drew a lot of attention. Heck if I know who these ladies were. Beauty queens. Yeah, that’s fine. But put something where people can read it, please. 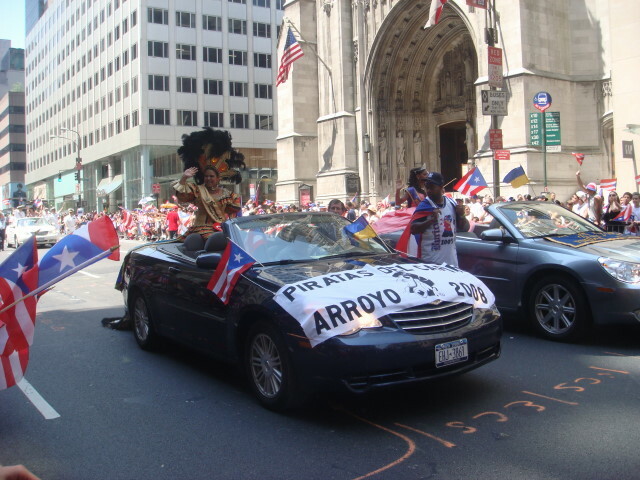 The hood says “Piratas Del” something and “Arroyo 2008”. I dunno. I saw these guys and thought “Navy”. Wrong. It’s the U.S. Public Health Service. Dancers! 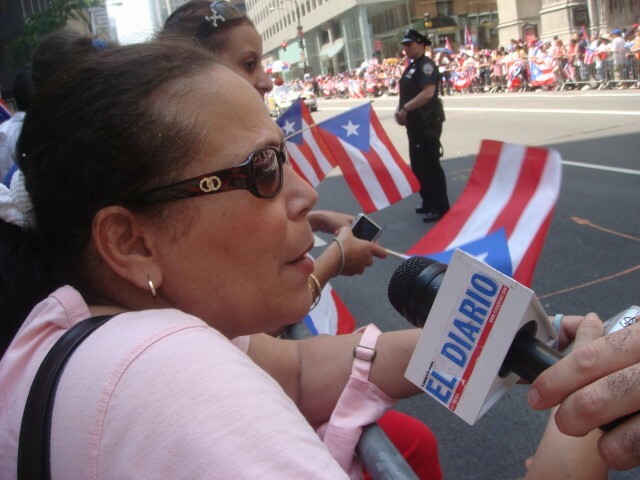 More specifically, The Little Branches of Borinquin. 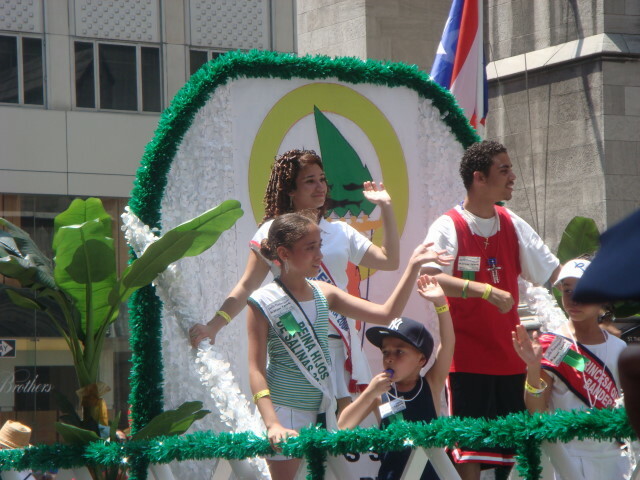 Borinquin or Borenquin is an area in Puerto Rico. These were pretty good dancers. I love this one. 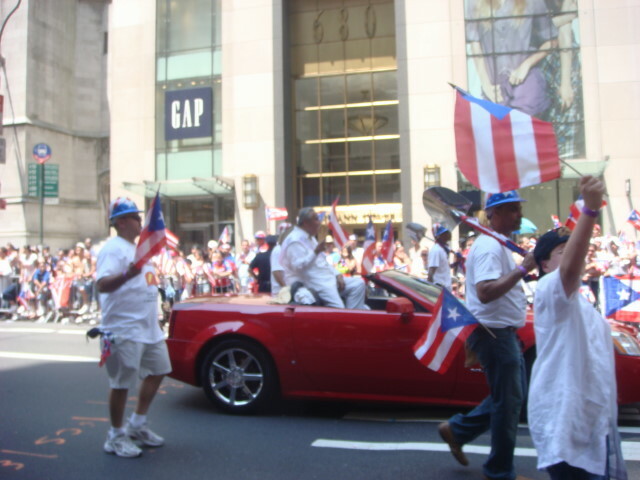 This is part of a big group from Banco Popular, a well-known and very large bank in Puerto Rico. Well, they had a beauty queen. And why shouldn’t they? I like this shot. 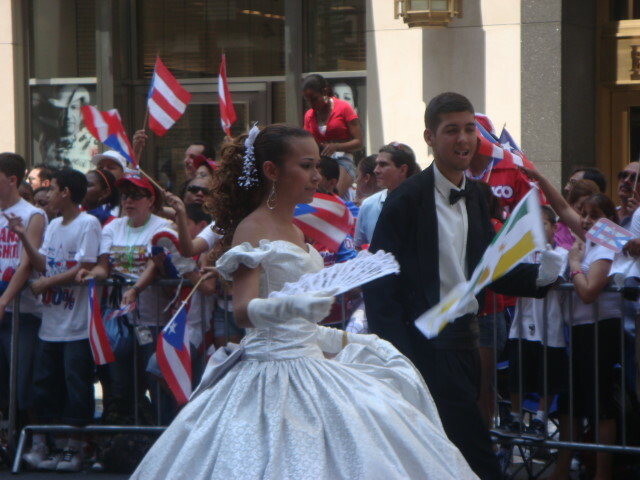 I would never confuse Chuck Schumer with Banco Popular beauty queens, but maybe others did. This is Senator Chuck Schumer. 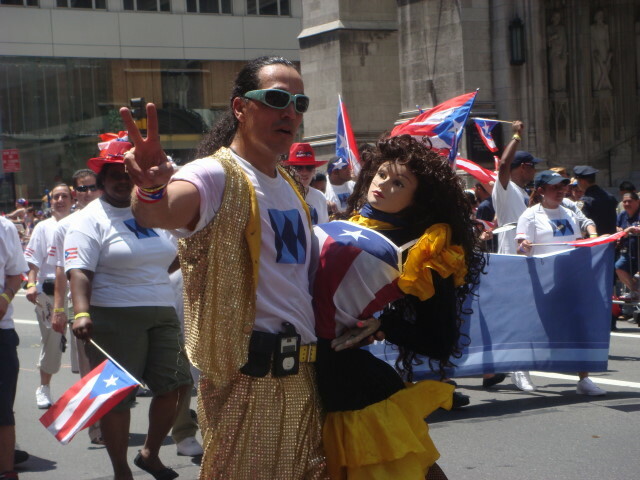 Puerto Rican for the day. 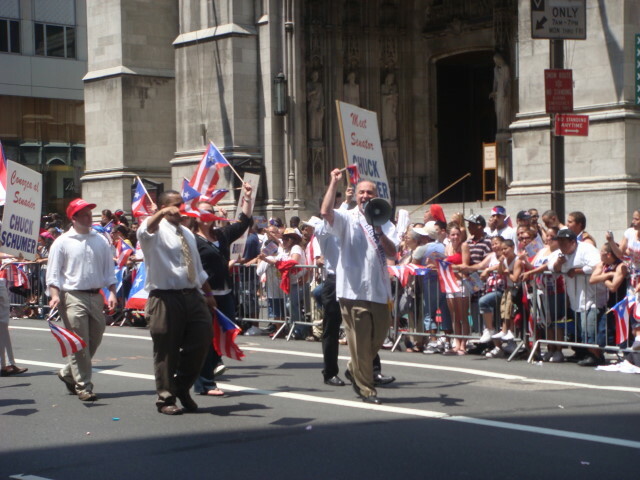 He was talking constantly in Spanish over the bull horn. A new area of Puerto Rico: Ponce. And they’ve got their beauty queens. She looks like she oughta be in Carnivale. My final picture of today’s post is another beauty queen. Who was she representing? Why Goya, of course. I have some of their beans in my cupboard. You probably do, too. As I said earlier. It was hot. And muggy. And hot. I had on some really good sunscreen and did survive without a burn. I was wandering through the Lower East Side and spotted a film crew. As I went past, I saw a little girl perhaps nine years old lip syncing and shoulder-swaying to unheard music and surrounded by a film crew. The little girl look slightly familiar. Perhaps not. I walked on as I was on a quest to look at a garden. I knew they’d still be there in five minutes. If you’ve never seen this stuff, film crews stick around for hours and do very little, at least to my eyes. It seems to be multiple takes and you never see anything. I did take a quick photo of the crew. I didn’t want to throw the kid off her acting. I wandered into the garden and spent less than ten minutes just looking at it and photographing it (it was the Sixth Street and Ave B Community Garden that I will post on separately). And when I came out. They were gone. Not even the slightest sign of them. Well, maybe a sign. There were postings by the NY film board or whomever that the new version of the Electric Company would be filming in the area. Maybe that was them. In any case, the only film magic I saw was a little girl doing a little dance and a little lip-syncing to unheard music and then vanishing. 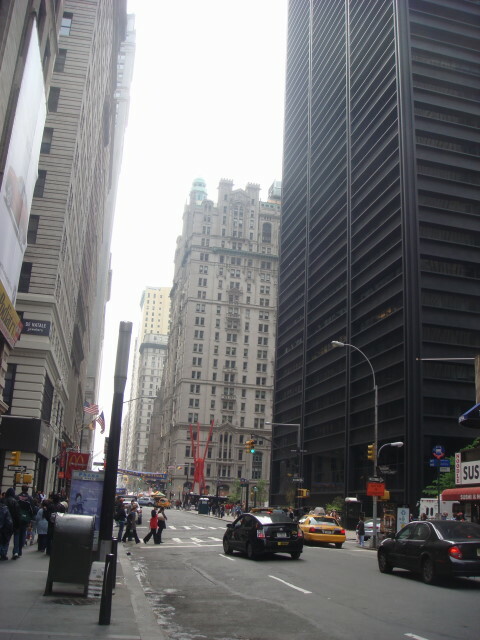 The start of Broadway is downtown in the Financial District. 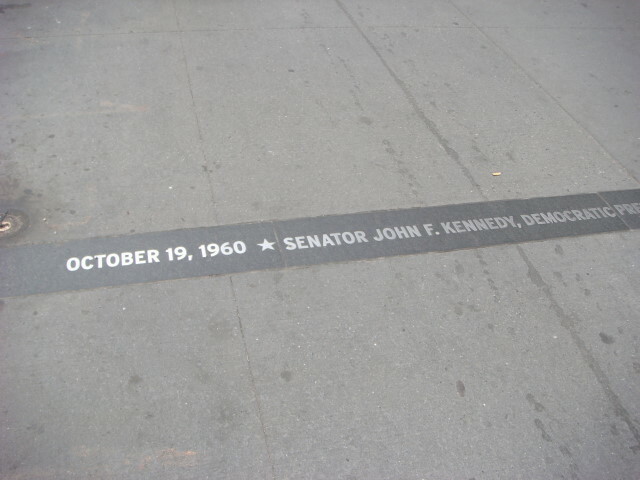 And just after Broadway starts, you run into the fabled Canyon of Heroes. This is where the ticker tape parades are held. Well, there’s no more ticker tape but I think they do a simulated version of it when they have those rare parades. The picture above is from the north looking southward. All along the sidewalk are these inserts. They hold a date, a name, and a description. 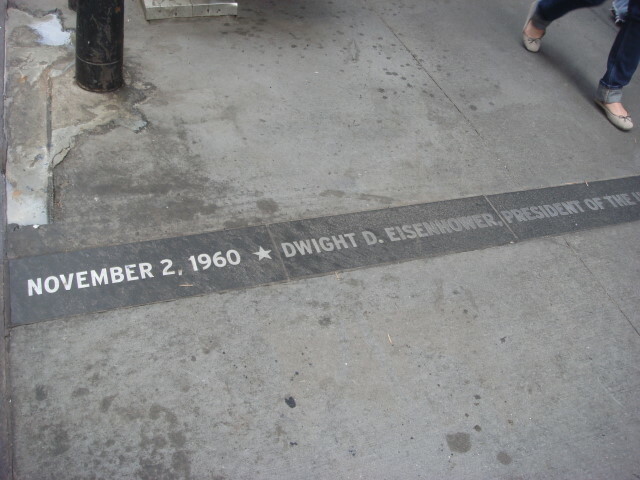 First, November 2, 1960 when President Eisenhower and Vice President Nixon were apparently featured in such a ticker tape parade. Well, those are pretty prestigious individuals. It takes a lot to get a ticker tape. Well, maybe nowadays. 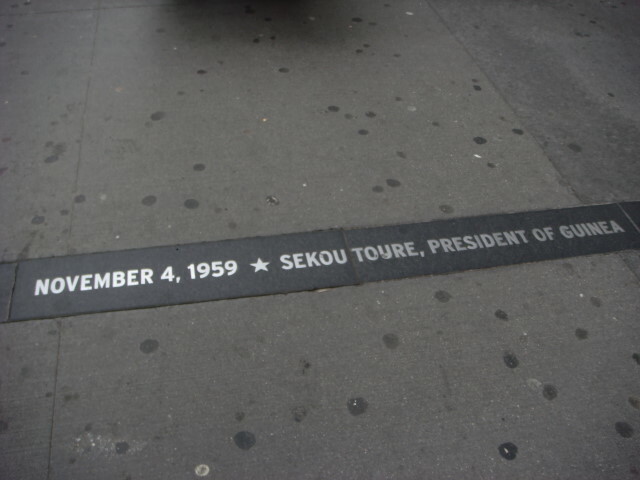 Back on November 4, 1959, they held a ticker tape parade for Sekou Toure, the brand new president of Guinea. He was about 37 at the time and had set up a one-party system to lead Guinea after freeing it from French colonial rule. 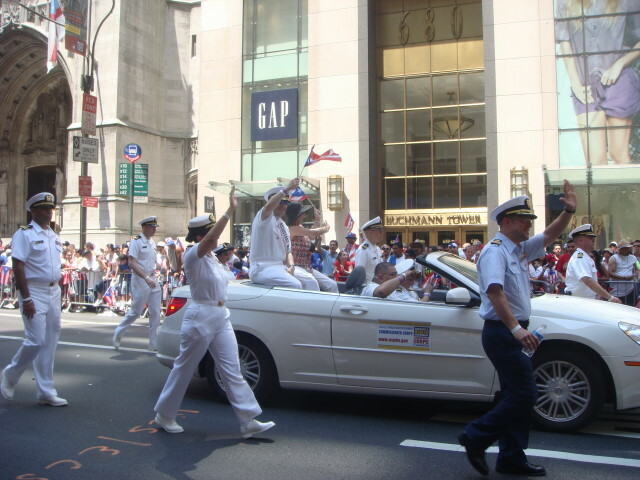 Nowadays, NYC gets a passle of presidents from other countries and I don’t see any parades for them.